Once more it was Monday so once more it was track. Bob was back and the session was as follows: (4x) 500f, 100j, 500f, 100j, 500f, 90s rest. I think we were doing roughly 1.50 for the 500s. I wanted to keep with Paul if possible and I did manage so that was good and a successful outing. I felt strong on this session but realise it is my sort of session (short reps) so I must keep this up during less pleasant sessions such as 1200 reps (though hopefully there shan’t be many more of those as we move into warm (when?) weather training. I had decided this week would be a slight taper week after being so rubbish on Saturday and resting on Sunday. Tuesday has become a routine rest day recently so this week was no different. However on Wednesday I didn’t have time to do my usual LSR in the morning so I just did an easy 5 miler in the evening with a few reps of Duke’s Mound. On Thursday I rested yet again and then became worried I might have forgotten to run so went out for another easy five on Friday morning just to remind them in preparation for parkrun. 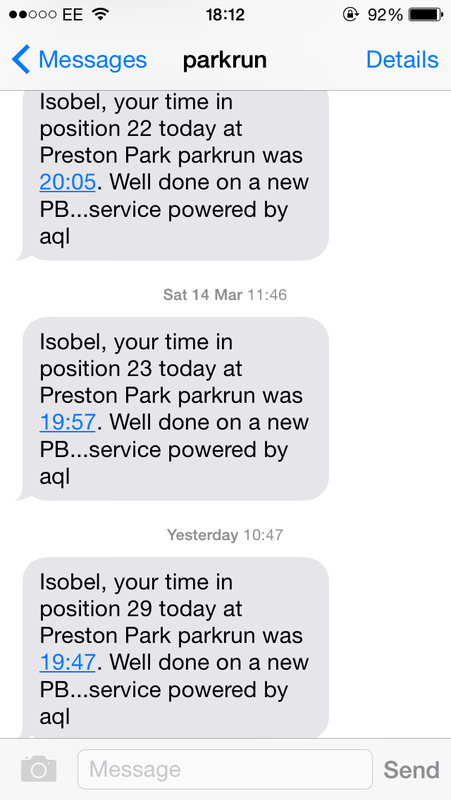 Once I returned I found a message from Emily saying she had to do a marathon pace run of half an hour on Saturday so would I like her to pace me to 19.45 for parkrun? Yes! Although this was a most scary notion I knew I must take the opportunity to be paced by The Protovator. Thus I found myself cacking it on the start line at Preston Park in a dense fog (literal not metaphorical). I had told Emily that she may shout at me as much as she liked but I managed to keep up with her for around 3.5k before I really started to feel like hurling and dropped off the pace. She immediately started spurring me on, reminding me that I’ve trained for this and that I can breathe AFTER the run. Although (I learnt later) I had dropped the pace a little towards the end it was only marginal and I crossed the line in 19.47 (Emily was pacing 19.45) as Emily continued to complete her half an hour at marathon pace. Those lost two seconds were entirely my fault. However I have finally set a true course record by ONE WHOLE SECOND! Officially my pb was 20.06 (until I ran 20.05, then 19.57 during the past few weeks) but I knew I’d run 19.48 at the dress rehearsal 2 years ago (my first sub 20 ever) and really wanted it to be official. Now it is. Thanks and credit completely to Emily pacer extraordinaire. It was really hard. Not sure I’ve run that hard ever but proves I can. Now I just need to be able to make myself exert that much effort without having someone else make me do it. 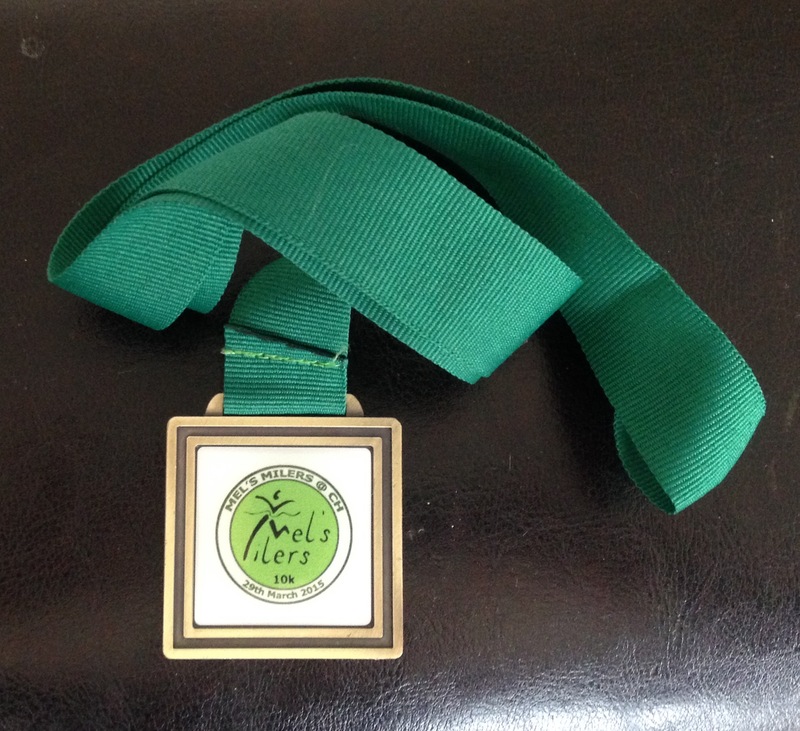 This morning (Sunday) it was time for Mel’s Milers 10k. The previous occasions I have done this race it has been dry, warm and sunny. Not so this year. It had been raining quite severely but thankfully this had eased when we got to the start but it was still stupidly windy and quite cold for this time of year. Soon enough it was time to go go go! So we did. Almost immediately turning into a hurricane that continued pretty much continuously for the first 2k in the grounds of Christ’s Hospital school. I thought well at least it will be behind us on the way back. No! My plan was to attempt to stay with Caroline for as long as possible. This went awry around 2.5k where she first began drawing away from me, however I was still close enough until 6k where she got away from me a bit more. I drew back to her around 8k but then she got away from me for good and ended up finishing 40 seconds ahead. I was still pleased with my run as I didn’t feel I dropped off concentration or effort wise anywhere near as much as I often do. I had to speed up a bit when we ran through the housing estate as I needed to follow the man in front as I didn’t know where I was going. I gave myself a stern talking to (out loud – luckily there was no-one near) from 8k onwards and managed to drag myself onwards. As I neared the finish I thought I might be on for a course pb even though the course was different. I was NOT. Thus the course must have been longer (along with wetter and windier) as I was a minute behind even though I ran much better (I felt). Thankfully everyone else was a minute or so down so I let myself off. This year I was 5th lady out of 138 and 29th out of 306 over all. A pleasing weekend’s running. I must get back to full training next week especially as the week after looks busy and I can’t taper again. Only 25 miles for the week but including three hard sessions.